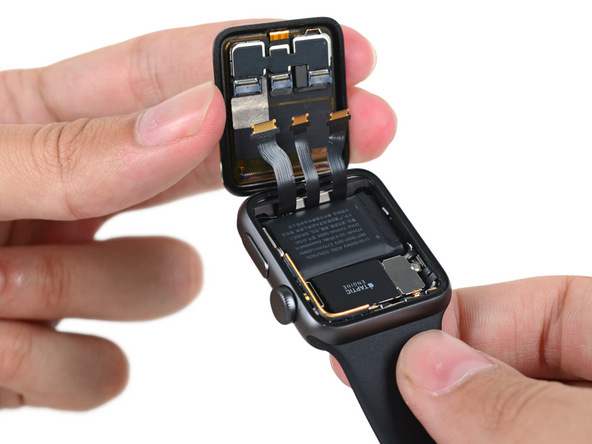 iFixit has published a work-in-progress Apple Watch Series 2 teardown that reveals a 273 mAh battery in the 38mm model, which is 33% larger than the 205 mAh battery in the original 38mm Apple Watch. However, battery life is equal to Series 1 models, likely because of the additions of a GPS and brighter display. The teardown says the Apple Watch Series 2's adhesive is "much stronger" than the original Apple Watch, and iFixit assumes this is related to improved water resistance. It also appears that Apple has added a larger metal shield next to the Digital Crown, which is also likely an improved waterproofing measure. Apple Watch Series 2 is marketed as swimproof, with an improved water resistance rating of up to 50 meters that makes it safe to use while swimming, showering, fishing, washing hands, jogging in the rain, and similar shallow water activities. Apple does not recommend scuba diving, waterskiing, or other high-velocity water activities. 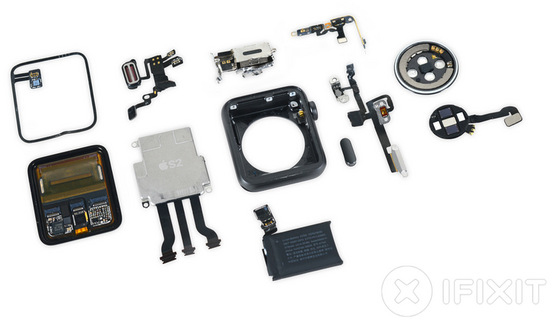 The teardown also revealed the Apple Watch's new S2 chip, larger Taptic Engine for haptic feedback, new antenna module with a GPS, the addition of a second microphone, and a redesigned speaker that is designed to fill with water, then vibrate to pump excess water from the body of the speaker. I'm more interested in a "new" S1 teardown. We know it has the newer chip, but does it also have the newer battery? If so, the newer battery with no GPS and not-so-bright screen might really help. So the big question I wanna know: :does this mean if I don't use gps or anything like that, that the battery life for my everyday casual stuff will be much improved? Yes? yes. at least according to some reviews. especially if your phone is always nearby, because then it will use the gps from the phone. Maybe some... in my understanding gps is used in tracking workouts only and that is if there is no iPhone around. There is the brighter display that might consume more energy. So I don't expect much of a battery life boost. I saw a review pointing to considerable battery improvements. Keep in mind that if you use it with the iPhone near you and if you reduce the screen brightness to match the Series Beta, you'll likely gain a lot of battery life. There's a brighter display, but as always it adapts to ambient light (and is off, more often than not). Only in bright sun will you use the screen brighter than it was before, I would think. The rest of the time: battery savings! How much? Who knows. Still charge-daily, which is fine by me. I've got to set the watch somewhere each night... That somewhere can be the charging pad. Good a place as any. With the lack of new hardware in the mac range, this Apple Watch is quite interesting. Doubtful, the Series 1 is slightly thinner and lighter. Can one adjust manually the brightness of the display on the AW? Apple Watch has an ambient light sensor. If you cover the top half of the display and then push the crown to wake the display, and then uncover the top half of display the display will adjust brightness. It's not the same technology as the iPhone and iPad so everyone assumes it's not there.